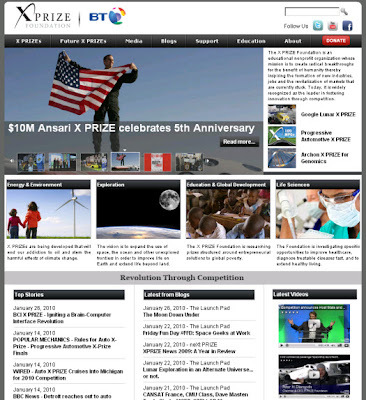 The X PRIZE Foundation’s website had maintained a design that was created in September of 2006 and after a much needed facelift, we finally launched a re-design a few weeks ago. In this post I’ll provide some details about the process and share some resources we used. First a little background. I’m Mark Krynsky and I joined the Foundation as a contractor in April of 2007 to migrate several of their static websites to be built atop a CMS platform to make them more dynamic and easier for staff to publish content. In addition to that we would launch a new website for the Google Lunar X PRIZE announcement in September of 2007 on this platform. After considering several options including commercial off the shelf systems and a custom built one, we chose an open source CMS called Drupal. It was a very challenging project that I could write a whole separate post on but we successfully launched all the sites. So although we overhauled the backend of the main site, the design stayed the same. I continued doing contract work for the website and in October of 2008 I joined the Foundation as Manager of Web Production. We continued to add on new pieces of content and functionality but the site began to look Frankensteinish so we started planning a re-design. We created an internal survey, started documenting content and functionality to add, and had several meetings to discuss this. We quickly realized that our new vision would require a very large undertaking. So with limited resources available, and wanting to do something quickly we took a new smaller iterative approach. In mid November of 2009 we decided to focus on re-designing our home page and several other design changes but maintain the current navigation, pages, and other content for the most part. Our goal was to incorporate some of the higher impact changes requested from the feedback we received that could be completed in a short timeframe. We fast tracked this with hopes of launching it in January 2010. The process involved creating a simple document outlining the content of the new page along with a graphic mockup. After a few rounds of reviewing, a design concept was agreed upon. At the heart of the new redesign was a new featured stories section. We researched several tools to implement it and selected the Frontpage Slideshow which offers some great options along with a module for Drupal integration. The rest of the design consisted of creating cleaner ways of displaying existing content and highlighting some new areas such as our PRIZE groups and videos from our in-house production team's YouTube channel. We launched the new redesign on time and on a very small budget. The Frontpage Slideshow module was only $30 and besides the in house content and assets created, I worked with just one developer on this project. I've always been very mindful of leveraging free or low cost services and open source software for web projects. This has become especially important now that I'm at a non-profit trying to maximize a tight budget. We have many more changes planned for the website over the coming months. I look forward to sharing more insight on what goes on behind the scenes of our web production department and share more details on the tools and services that bring our sites to life.